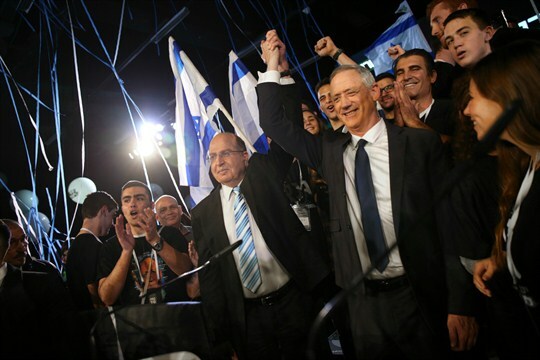 Retired Israeli military chief Benny Gantz, right, raises hands with former Defense Minister Moshe Ya’alon during the official launch of Gantz’s election campaign in Tel Aviv, Israel, Jan. 29, 2019 (AP photo by Oded Balilty). Back in December, when Israeli Prime Minister Benjamin Netanyahu’s coalition decided to dissolve parliament and call new elections, the news inspired a chain reaction of yawns. Despite Netanyahu’s growing legal problems, the overwhelming consensus was that he was headed for another victory, one that would allow him to break the record of Israel’s founder, David Ben Gurion, as the country’s longest-serving prime minister.